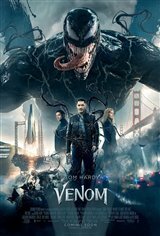 Investigative reporter Eddie Brock (Tom Hardy) is trying to expose Dr. Carlton Drake (Riz Ahmed), whom he believes recruits vulnerable people for tests that end up killing them. Eddie doesn't like the fact that his girlfriend Anne (Michelle Williams) works for him, or at least, the firm she works for does. One night, Eddie discovers a woman (Jenny Slate) following him. She tells him she works at the Life Foundation and needs his help. She and her team have discovered creatures called symbiotes, which attack people. She tells him Carlton Drake believes the union between human and symbiote "is key to our evolution." When Eddie investigates, he's attacked by one of the humans undergoing experimentation. He soon feels sick and begins hearing a deep voice inside himself. When men come to his apartment demanding the return of Mr. Drake's property, Eddie discovers he has superpowers when he defends himself. The powers belong to the voice inside him, and he tells it, if it's going to stay, it can only hurt bad people. However, he soon finds he has no power to control the beast within, which transforms into a creature that calls itself Venom.